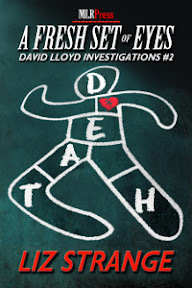 I first met Private Investigator David Lloyd last spring when I read Missing Daughter, Shattered Family. I appreciated the old school mystery feel of the novel—a detective hitting the pavement in search of answers as he tried to track down a missing woman. I took an instant liking to David who is not only smart and tenacious but fair and level headed as well. In A Fresh Set of Eyes, having just recovered from his injuries during his last big case, David is hired by a mother to prove her son and his friend are innocent of murder. The two had been convicted for the murder of two young boys and had already spent 10 years of their lives in prison as a result. The case against them had been extremely flimsy from the get go, but anxiety and fear to put someone behind bars rushed the trial and got a conviction. David has very little to go on initially, but he believes in the young men's innocence and refuses to give up. On the home front, David’s partner, Jamie, is still dealing with the ramifications of coming out to his family, particularly his father who is less than accepting. Having gone through that with his own father, David understands how difficult it must be for Jamie. In addition, Jamie and David have taken a young woman under their wings, a former prostitute, who is working through her own issues. She can be quite a handful, but David is determined to help her. I like the way the author portrays David and his partner’s relationship as well as their struggles. It’s very natural and realistic. You don’t often come across a mystery novel where the protagonist is gay, and I find it refreshing. David and Jamie’s relation is one of the highlights of the novels, their very different personalities and areas of expertise playing well off each other. It’s obvious the two men love each other very much. The personal story never overshadows the actual mystery. Rather, it compliments it. Especially given how David enlists the help of his family and friends to help him with the investigation, always conscious of their safety. Like with her first book, Liz Strange puts David through the expected motions of a more realistic P.I. as he canvases the neighborhood, conducts interviews , does a lot of research, and calls in favors of friends on the force. It’s a traditional mystery in every sense. And I love that about the book. The crime itself was inspired by a the case of the West Memphis Three, three men who were wrongly convicted of killing three boys. Liz Strange uses many of the details of that crime in her own story of the murder of two brothers, but adds her own spin to it--and twists. I was able to fit the pieces of the mystery puzzle together a little quicker than David, but that didn’t hurt my enjoyment of the novel. And even so, there was still a surprise or two up Liz Strange’s sleeve. In summary, Liz Strange has impressed me yet again, and I hope I’ll have many more opportunities to visit with David and friends. You can learn more about Liz Strange and her books on the author's website. I love the idea of the relationship building on and strengthening the mystery, and there has been no mention of homosexual investigators before, so I am eager to check this out when I can. Your review totally does the book justice. I am adding this to my wishlist! Í'm not a big mystery fan, but I think the personal relationships would make this one an interesting read. Enjoyed your review, and think I'll take a look to see if the library has it. Thanks! Heather - I hope you do get a chance to read it! I'm really enjoying the series and really like how much the author has put into her characters and their relationships. Terri (Alexia) - I like books with strong character development and I felt that the author did a good job putting together her characters for this series. I do hope you'll get a chance to read them!